It’s not ideas that we need more of in Australia argues Ray Thompson. A better model for successful innovation involves working more in tandem with business and much better marketing skills. I applaud the recent Innovation Statement by the Prime Minister. This country needs such leadership and I have seen an immediate uplift in enthusiasm for innovation over the subsequent weeks. Innovation is not invention. We have plenty of ideas and inventors in Australia – as does every other country. Indeed at CSR, we are approached every 2-3 weeks by local inventors with ideas that, in principle, look very attractive. Unfortunately, in most cases they usually fail to create sufficient value to make them commercially viable. And herein lies the difficulty for the Federal Government and the nation in the ‘innovation revolution’. The ideas boom we actually need is ideas and action that will create a more efficient nexus between inventors – Universities, CSIRO and individuals – and Australian industry. Recently arrived from Scotland, Dr. Kevin Cullen, CEO of UNSW Innovations, told the audience at a CRC Forum in 2014 that if he was asked to create a system that ensured the vast majority of research work was never commercialised by industry it would be the Australian system. It seems around 98% of all University research work remains locked behind academic brick walls and intellectual property lawyers. In addition, PhD studies still typically follow the traditional model of a secluded 3-4 years University-based research. Similarly, private inventors often approach us after 5-10 years of backyard development. Industry is then presented with a ‘brilliant’ new concept: the inventor can never understand when we conclude the value created is substantially less than the cost to develop it – and is therefore not commercially viable. A better model, commonly implemented overseas, particularly in the USA, is where the University agrees with industry about the market opportunity and the PhD student or other researcher works to ‘invent’ a solution that meets this need. This model is not just achieved in tandem with industry, but often based within a company environment and if successful, often ends up being employed by industry, or even in the creation of their own start-up. It’s mainly due to this market-based model that so many PhDs end up with US businesses and not in Australia. We note that this issue appears to have been flagged by Industry Minister Pyne as a focus for University reform, and some Universities are now starting to open up their IP vaults to Australian industry. At CSR we encourage and support these initiatives and stand willing to further contribute to the process of creating a smarter innovation climate in Australia. It is often claimed that innovation funding does not exist for entrepreneurial inventors in Australia – which is why they have to go overseas. I would argue this is not necessarily the case. We have a very strong banking system in Australia and big companies generally have sufficient funding reserves for investment in innovation. The real issue is risk – particularly for publicly listed firms using shareholders’ money. And it is risk assessment where, in my view, we lack core skills in Australia. It is marketing skills that need development here – more so even than technical skills. By better marketing skilIs I mean – market immersion, segmentation analysis, value proposition creation, market research, product development and targeted communication strategies. With more highly skilled marketing the business risk is reduced, enabling companies to commit funds, especially if they have confidence in the accuracy of the market assessment of the value proposition and resulting volume growth rates. Volume is of course a critical element for success – and we can struggle in Australia with our small, geographically dispersed market. Certainly we can target our massive regional Asian market – but having worked and lived in Asia for eight years I know how difficult it is to get both value propositions and communication strategies right. Each country is a different market and needs to be treated as such. In any event the question is always asked – do Australians buy this product? First and foremost a track record needs to be established in the local market to ensure the products and marketing are perfected before venturing overseas, where fulfillment capabilities are often stretched. In my 45 years working for one of Australia’s oldest and largest manufacturing companies, I have seen too many government innovation and development programs waste millions of taxpayers’ dollars trying to pick winners and fund backyard inventors requesting help to ‘commercialise’ their brilliant idea. While occasionally our country may strike it lucky, more commonly we find that insufficient marketing effort has been undertaken. It may be a brilliant piece of engineering ingenuity but nobody wants to buy it! Yet large Australian firms with the marketing, engineering, cashflow and manufacturing capability to commercialise ideas are often declared ineligible for government assistance. Sure, big Australian companies can try by setting out and doing it all themselves – but the marketing work still needs to be done internally to determine if it is worth funding. This is a Catch 22 situation for business and for innovation progress in Australia. A better model may well be to align inventors with appropriate companies to work together. Government seed funding for product development and market analysis could be provided on condition that the inventor has established a mentoring arrangement with a capable Australian firm. This would not only provide the necessary marketing funding to reduce risk for the firm, but avoid wasting taxpayer money on potentially non-marketable ideas. Furthermore, we need to review the relationship between Universities, the CSIRO and capable companies. In Germany, the Fraunhofer Institute provides a bridge between academic research and practical application. Staffed with brilliant scientists and engineers they have helped drive Germany’s world-leading industrial innovation programs. We need an Australian version of the Fraunhofer Institute that can be a leading light not just for Australian innovation but with strong regional reach into Asia. We encourage the federal Government to seriously review this option: indeed Australia already has a successful model from which to begin! The Defence Materials Technology Centre (DMTC) operates in a very similar fashion to Fraunhofer, but currently is limited to the defence industry only. Expanding its scope to manufacturing and service industry innovation could well provide the basis for achieving the future for Australia outlined so impressively by the Prime Minister. I might suggest they be called the Harrison Institutes, after James Harrison the Geelong inventor of mechanical refrigeration in 1855 (the same year, coincidentally, the Colonial Sugar Refining Co. (CSR) was founded by another Scottish born engineer – Edward Knox). Let’s hope that 160 years later we will create another golden age of innovation in Australia. General Manager Innovation – CSR Building Products. 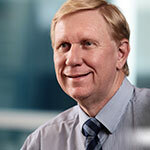 Ray Thompson has spent more than 30 years with CSR in driving building energy efficiency in Australia and Asia. Ray has qualifications in science, economics and marketing, he has represented CSR on numerous projects including state and federal governments, academic institutions and industry associations.